All visitors to the Old City of Jerusalem are impressed with the 2.5 miles of walls, and seven gates, that encircle the 220 acres and 33,000 inhabitants of the Old City. 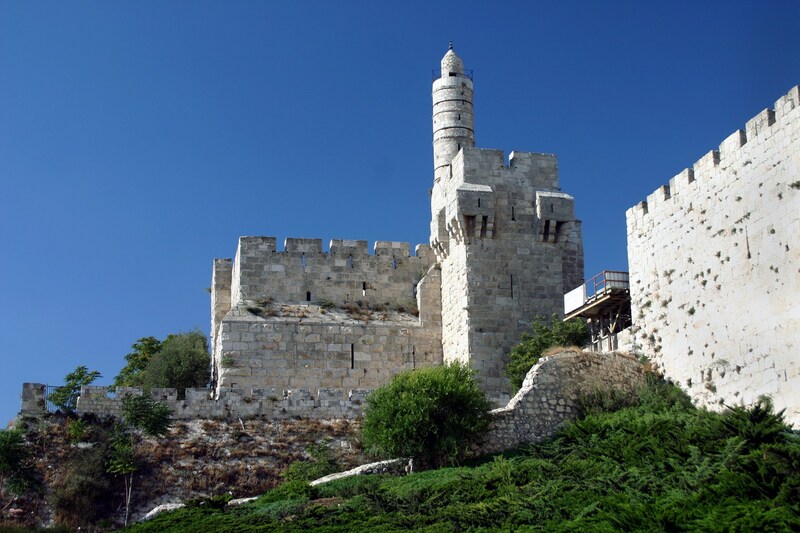 “David’s Tower” at the Citadel south of Jaffa Gate—Portions of which were built by Suleiman the Magnificent. Click on Image to Enlarge and/or Download. In the main, these walls were built under the direction of Suleiman the Magnificent between 1537 to 1541 (Suleiman died in 1566). Suleiman was the most powerful ruler during the long period of the Ottoman Empire (ca. 1517–1917). After many years living in and traveling to Israel, and oohing and aahing at the the Old City walls, I was very excited on my first visit to Istanbul to visit the Topkapi Palace, from which Suleiman ruled the Ottoman Empire and the Süleymaniya. 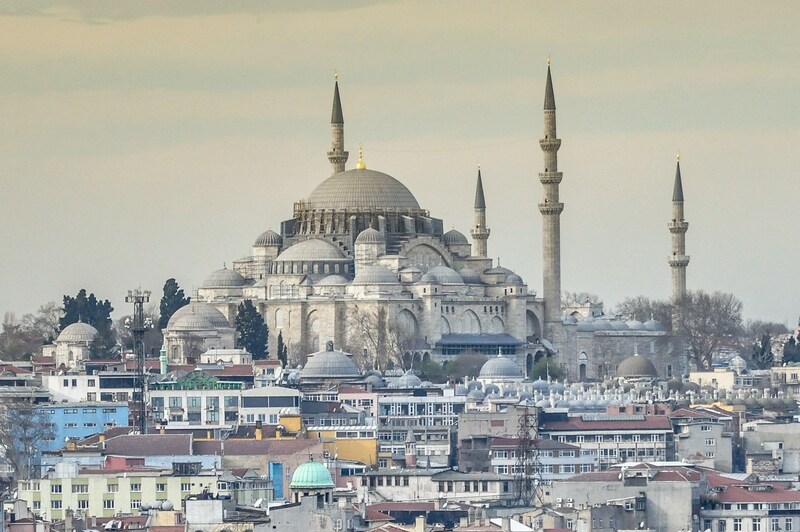 The “Suleymaniye” is a mosque complex that was built between 1550 and 1557 by the famous architect Sinan to honor and house the remains of Suleiman the Magnificent (ruled 1520 to 1566). [For Christians, remember Luther died in 1546 and Calvin in 1564; the very time of Suleiman] The complex (Turkish külliye; ca 18 acres in size) consists of the famous mosque, schools, a hospital, a hospice, a “soup kitchen,” a Turkish bath, and the tombs (Türbe) of Suleiman, his wife Roxelana, the architect Sinan and others. View looking southwest at the exterior of the Suleymaniye Mosque. Note the four minarets and the large central dome of the mosque. Just below, and to the left (east) of the mosque there are two domes. The large dome covers the Türbe of Süleyman while the small dome covers the Türbe of Roxelana, his wife. 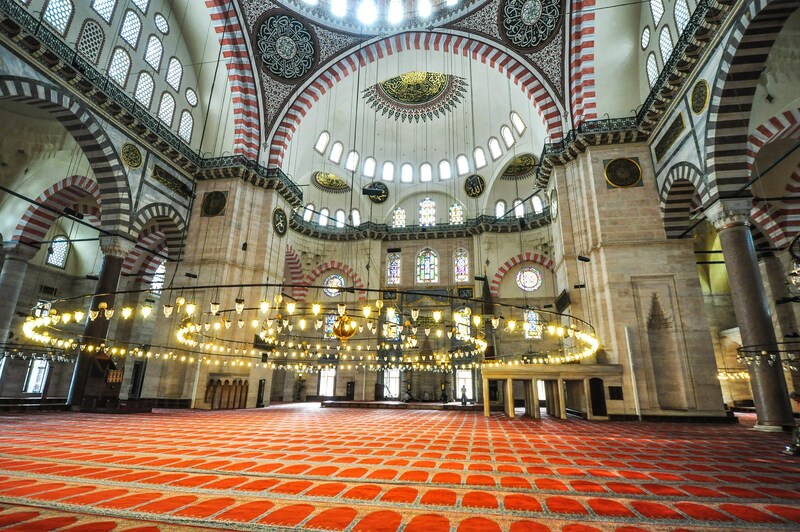 View looking across the interior of the beautiful Süleymaniye Mosque toward the minbar (pulpit) and the miqrab (niche facing Mecca). It measures 230 x 200 ft. (70×60 m.). Note the individual prayer spaces on the carpet. Click on Image to Enlarge and/or Download. Next time—the tomb of Suleiman the Magnificent. This entry was posted in Places in Turkey, Tomb and tagged Istanbul, Mosque, Roxelana, Suleiman the Magnificent, Walls of Jerusalem. Bookmark the permalink.